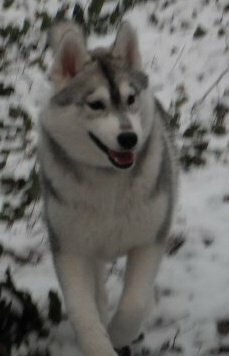 We are a small Siberian Husky breeder and show kennel located in the beautiful Smoky Mountains of Knoxville, Tennessee. Originally located in St. Petersburg, FL, our kennel was established in 1991. What is Yo no Bi? Yo no Bi is Japanese and can be defined as: any shape that is created for its basic functions has its own beauty, and brings even more enjoyment to your life. The power of wisdom and skills carried over from the past and gained in the future - this is YO no BI, also translated as: the beauty in practicality. This develops with each new generation. One can relate this to Siberian Huskies this way: the breed was developed to perform a task - carry a moderate load over long distances in a harsh climate, and that function produced a beautiful breed of dog - the Siberian Husky. We believe in continuing that tradition of correct, beautiful dogs - excelling with each new generation. How does this apply to Traxx Siberian Huskies? The "perfect Siberian Husky" (commonly misspelled as Siberian Huskey or Siberian Huskeys) is impossible for anyone to breed. As an ethical Siberian Husky breeder in Tennessee , our goal is to adhere to strict ethical guidelines, remember the original function of the breed, research historical accounts, and study the AKC standard to assist us in planning every litter of puppies. We strive to breed the best possible puppy: in structure, function, beauty, and temperament. Continual learning is key to understanding where the Siberian Husky came from and seeing where the breed is going. All of our dogs are screened for hereditary eye and hip defects and are registered with OFA (Orthopedic Foundation for Animals), CERF (Canine Eye Registry Foundation) and/or SHOR (Siberian Husky Ophthalmic Registry). We keep very few adult Siberian Huskies, as we feel that each one deserves their share of our attention - training, socialization, grooming, and (of course), hugs, kisses, belly rubs, etc. We breed very infrequently - usually only to obtain a new show puppy for ourselves. Older dogs and pet puppies are occasionally available for sale from those litters to select homes. Please feel free to contact us via email or via the phone number, below. We will be happy to speak to you about adding a Siberian Husky to your family. If you already have a Siberian Husky, and wish to gain more knowledge, from a reputable Siberian Husky breeder with over 20+ years of experience, about your beloved pet, and/or conformation showing, drop us a note or call. We try to respond to every email and/or call in a reasonable time frame.